If you hate cleaning but love when your place looks clean, these storage solutions may save your messy soul. 1. 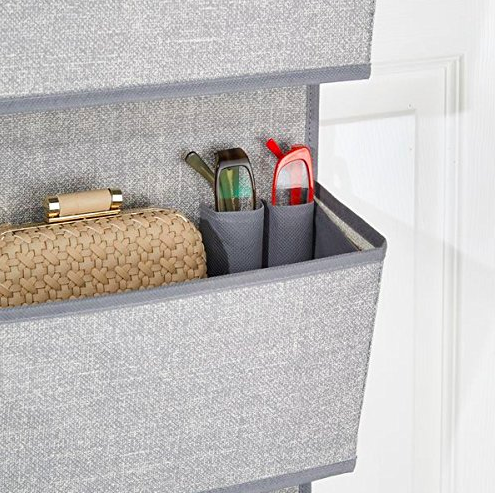 An over-the-door storage caddy, so you'll be able to quickly hide stuff that was previously strewn about (there are even tiny pockets for things like pens and sunglasses) and then shut the door on your secret mess. Get it from Amazon for $16.99 (available in nine styles). 2. A barn wood storage bench you ~wood~ never guess can fit so much stuff inside it! Go ahead, get another pair of shoes. No one will even notice. Get it from Amazon for $144+ (available in three colors). 3. Or a soft, tufted storage ottoman that'll easily double as a comfortable living room bench. 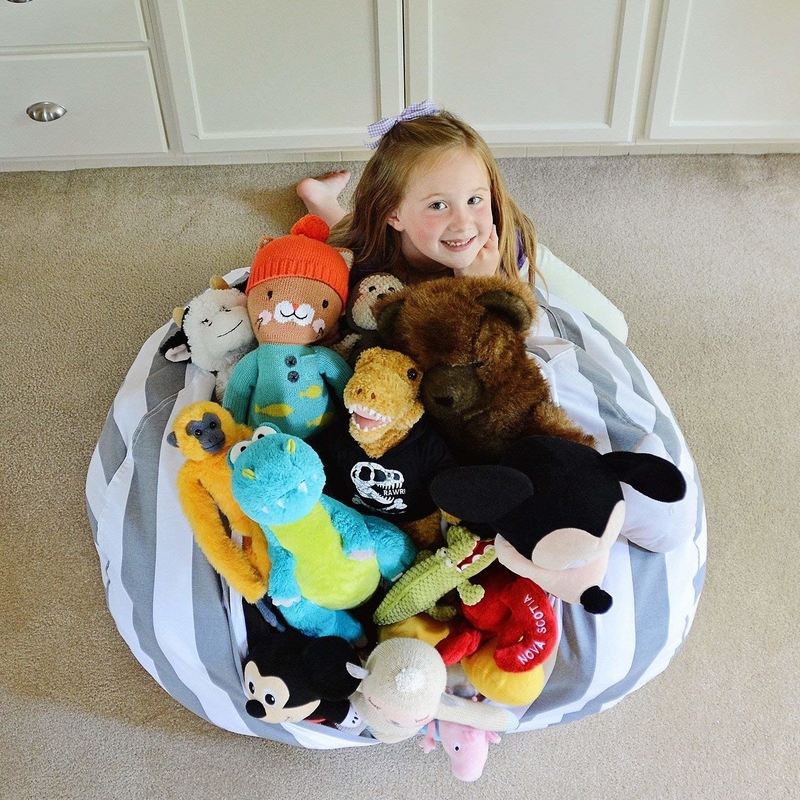 With all the space inside it, it's not ~tuft~ to see how this could come in handy when you need to throw some old laundry in with the throw blankets. Get it from Amazon for $170.43+ (available in two colors). 4. A woven cabinet for those emergency moments when you need to hide the dishes you've left in your room in a place where they will have air to breath until you finally get to them. Get it from Urban Outfitters for $729 (available in three colors). 5. 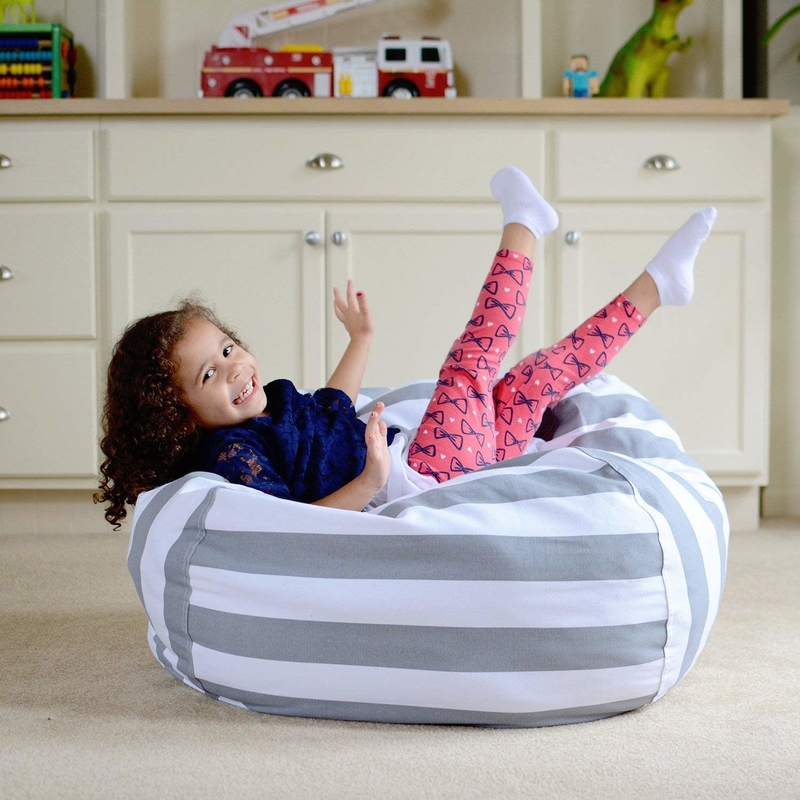 A storage bean bag you can use to help your kids shove their toys somewhere other than under the bed (or use yourself as a hidden laundry hamper). Get it from Amazon for $29.99+ (available in eight colors and three sizes). 6. A utensil caddy for kitchens that suffer from too much clutter and overflowing junk drawers. 7. A storage bag with clear strips that'll let you see what clothes you packed away in a rush (instead of sorting through loose items you shoved under the bed). Get it from Amazon for $8.69+ (available in six colors and six sizes). 8. A stackable sliding shelf with two tiers — you can still throw things under your sink, just onto shelves, making your bathroom look a little bit less ~crappy~. 9. A felt pocket that's gonna hold charging phones, reading material, remotes, medicine, and anything else that may have been keeping your bedside cluttered. Get it from Amazon for $16.25. 10. Or a bigger bedside caddy for anyone who doesn't have room for a nightstand but has enough stuff that they could fill a dresser. Get it from Amazon for $10 (available in two colors). 11. 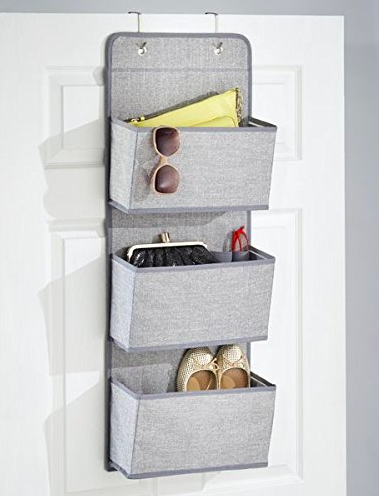 A shoe rack with flat storage space to put dog leashes, gloves, hats, keys, or any other things you'd otherwise leave out to grab as you head out. Get it from Amazon for $41.99+ (available in three colors). 12. A divided laundry hamper so you can efficiently get laundry separated even if you're just throwing your clothes into the hamper (this will help you make sure to keep the darks and lights organized even as you toss random articles in). 13. 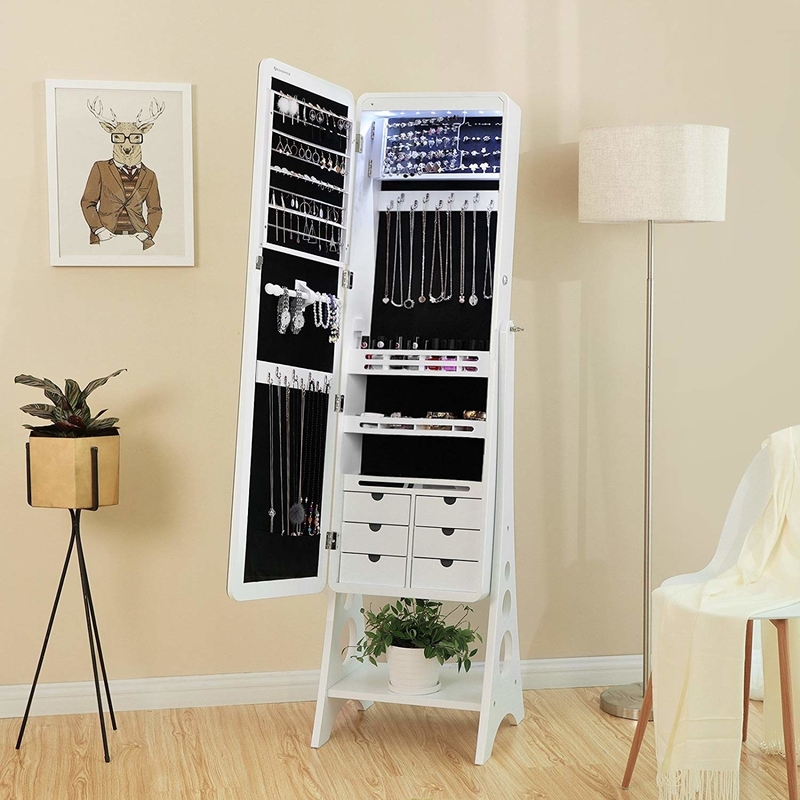 An organized cart with 10 drawers that'll keep your craft room a space where work can actually get done, even if your cleaning skills aren't as top-notch as your artistic abilities. Get it from Amazon for $39.29. 14. A car organizer because you basically live in your car... and it shows (that is, until you get this to help shove that clutter into one useful spot). Get it from Amazon for $23.61. 15. A bedside table with so many drawers you can hide a ton of stuff. Plus, it's so dang charming, no one will ever guess the mess that's inside. Get it from Amazon for $72.99. 16. 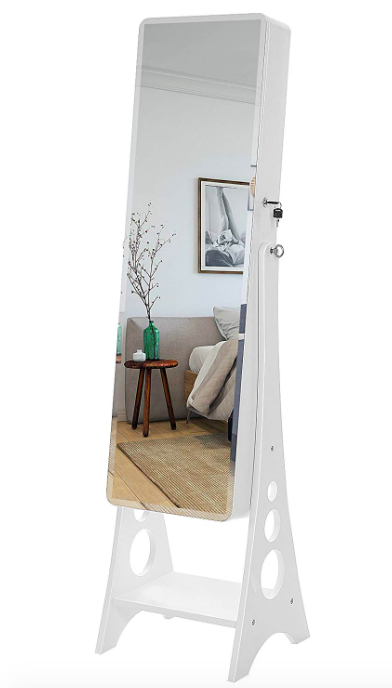 A mirror storage cabinet to hide loose things behind before guests arrive. Bonus: it's gonna let you ~reflect~ on how clever your storage skills are every time you see it. Get it from Amazon for $191.45. 17. A side table for stashing the mess of magazines, remote controls, umbrellas, gloves, and other odds and ends that turn up when you actually spend time living in your living room. Get it from Amazon for $115.58 (available in two colors). 18. A linen folding chest that'll subtly complement every room it's in while adding a convenient and sophisticated storage solution in small spaces. I have had this folding chest for three years (I actually repurchased it in a different color after moving apartments) and I rave about it all the time. I use it as a hidden litter box. I cut a hole in the side for my cats to walk through and have the litter box on the far end. There's enough room for the the litter box, the box of fresh litter, their scoop, and an odor remover. I have guests move to sit on it constantly, with no idea that they're about to sit on a litter box. It's definitely sturdy enough for people to comfortably sit on. I love that it opens in the center so that I don't have to take off the entire top whenever I'm cleaning, which is also useful for grabbing things if it's used as storage. Whether you use this for seating, storage, or the cat's bathroom, I highly recommend it. Get it from Amazon for $44.99 (available in 10 colors). 19. A storage bench with a classic vibe and enough room to hide a body... of thesis research you have in piles all over your studio. Get it from Amazon for $97.68. 20. A storage bed so you can tuck your stuff away right before tucking yourself in. Get it from Amazon for $443.99 (available in two colors). 21. Or a bed with drawers for keeping things you'd wear daily when you simply don't have room for a full dresser. Plus, having drawers so close to the ground makes it easier to put away the clothes you've left on it. Get it from The Home Depot for $331.65+ (available in two colors). 22. A pair of storage bookends to quickly organize the pens, papers, and pins you always seem to have scattered around your desk. Get them from Amazon for $17.95 (available in four colors). 23. A hidden jewelry cabinet — it's gonna save your jewelry collection from the certain doom that is a trinket dish and help tidy things up when your necklaces start tangling up your bedside table. Get it from Amazon for $161.99+ (available in two colors). 24. 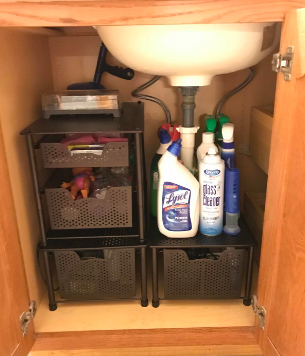 A slide out storage tower that'll fit in a tight spot when you're in a tight spot and need to hide away the bulky necessities that take up counter space in your kitchen, bathroom, or laundry room. 25. 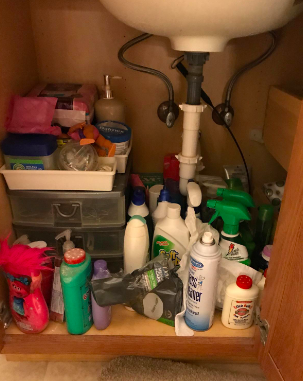 A hidden storage mirror that's gonna save anyone with messy bathroom counters — just slide things in the side, check out your "organized" self in the mirror, and walk away. 26. And finally, a lifting coffee table that'll help hide a mess SO WELL, it's sure to lift your spirits up right along with it. Get it from Amazon for $132.15+ (available in two colors). You, shoving your mess somewhere no one will ever find it. Looking for other storage solutions in your life? Check out the products in the posts below!